Special update: The Sony FE 90mm ƒ/2.8 Macro was awarded a Lens of Distinction in the Best Prime Lens category of our 2015 Lenses of the Year awards! Sony has been aggressively filling out its lineup of lenses in the E-mount, and the 90mm Macro fills a particularly obvious gap. Until now, if you wanted to do any kind of macro work on an E-mount body, you had to use an adapter. The Sony FE 90mm ƒ/2.8 Macro G OSS will fit on both APS-C and full-frame E-mount Sony bodies; on the NEX-7, the lens provides an effective field of view of around 135mm. The lens is scheduled to start shipping in July, 2015, ships with a round lens hood, and will be priced at approximately $1,100. Our review sample of this lens proved to be exceptionally sharp, even when used at its widest aperture setting of ƒ/2.8. When used on the NEX-7 with its APS-C sensor, the images shot were tack-sharp from ƒ/2.8 onward. Mounted on the full-frame A7R, there's a trace of corner softness at ƒ/2.8, but stopping down to ƒ/5.6 provided incrementally better corner sharpness until it became tack-sharp. Diffraction limiting begins at ƒ/11, but you'll be hard-press to notice any impact on sharpness until ƒ/16, where generalized softness begins to set in. There's little chromatic aberration to speak of from both the test results and looking at the sample images. Both the NEX-7 and A7R employ in-camera correction for chromatic aberration, corner shading and distortion, and to give you a fuller picture of lens performance we've shot our sample images with and without these settings enabled. Light falloff is essentially a non-issue for the 90mm ƒ/2.8 macro when mounted on the sub-frame NEX-7; the only corner shading of note is found at the ƒ/2.8 setting, where the corners are a 1/4-stop darker than the center. At any other setting there is no light falloff. Corner shading is a bit more prominent for the lens when mounted on the full-frame A7R. At ƒ/2.8, the corners are 3/4 of a stop darker than the center. This light falloff reduces dramatically when stopped down to ƒ/4 (where there is just over a third of a stop of light falloff). At any other setting, light falloff is inconsequential. The Sony 90mm ƒ/2.8 macro is optimized to produce almost no distortion; the numbers are essentially zero when mounted on the NEX-7. On the A7R, there is a tiny bit of barrel distortion in the corners (almost +0.2%) but this is a very small amount that's easily correctable. Despite the fact that it's a macro lens, the Sony 90mm ƒ/2.8 Macro focused quite quickly, taking around a second for the lens to focus its range from infinity to close-focus. The focus action is all internal, so there is no change in the lens' size as it focuses; the front element doesn't rotate, so attached 62mm filters will stay where they are. The lens is purpose-built for macro work, so it's no surprise that it excels here, offering full 1:1 reproduction at its minimum close-focusing range of 11" (28 cm). The lens is equipped with a focus limiter switch with three settings: one for unrestricted autofocus operation, and two settings which limit the range of autofocus movement and thus speed up the operation. The first setting limits the range to macro (between 11'' and 20'') while the second setting limits the range beyond macro (20'' to infinity). The Sony FE 90mm ƒ/2.8 Macro OSS is a sturdy and well-built lens, with a metal construction. It's a bit larger than other prime lenses in the system and heavier (it's around 600 grams, or over 21 ounces). The size works against it for macro work, as the NEX and A7 series of camera have such a tiny body area to lock on a quick release plate. The plates have some amount of wobble when a plate is attached: a tripod socket on this lens would have been a real help. That said, Sony's implementation of OSS suggests that it's envisioning photographers will leave their tripods at home when they use this lens. The fit and finish of this lens is really nice: the lens has a distance and reproduction scale adjacent to the focus ring, as well as the focus limiter function. Also present is a focus hold button, which allows the user to lock in focus while recomposing the scene. The focusing ring is 1 1/4" wide, composed of a dense plastic with raised plastic nubs. The focusing ring has two settings: pushed away from the camera body, it is in autofocus mode; pulled towards, it is in fully manual mode. In this mode, the ring has hard stops on the infinity and closest focus settings, and has a generous 150 degrees of travel between these points. The ALC-SH138 lens hood is a bayonet-mounted round hood that's 2 1/4" long, providing a generous shade to prevent lens flare. 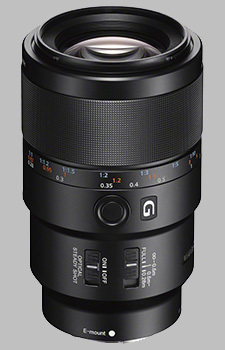 Sony includes its OSS ("Optical Steady Shot") image stabilization technology in the lens. While the NEX series of camera includes sensor-shifting image stabilization, the A7 series of camera does not, so image stabilization is possible regardless of the platform. In our testing, we note around 2 and a half stops of hand-holding improvement; check out our IS Test tab for more detail. The only directly comparable lens in the system: however, you'd need the Sony LAEA3 adapter to attach it to an E-mount camera, and we couldn't say how that might affect the image quality. On the Alpha SLT series of cameras, the lens performed quite well, though it's clearly not as impressive as the Sony 90mm Macro; sharpness and corner shading have been distinctly improved, as well as incorporating image stabilization. It's a pricey lens, but right now it's the only E-mount option that works out-of-the-box for macro photography. It might be expensive, but you get an exceptionally sharp lens with some great features - certainly, worth the investment. Below we've decided to present our studio sample images with both in-camera corrections ON and OFF. Extremely sharp. Excellent contrast and colors. Dream like bokeh. OSS works very well for hand shooting. Heavy. Expensive, but you get what you pay for and more. Great lens for macro work and short tele. Very nice and accurate picture quality which resolves the 42 mps of the a7rII with ease. Phantastic bokeh without any unartistic interferance. It just looks great, being tack sharp, unforgiven and at the same time very pleasing to look at. This lens feels precise, the focusing is extraordinarily accurate and typical, working with the lens is a satisfaction. I love this lens. I use it to take pics of all my paintings! Outstanding sharnes, nice focusing, water seal, manual-autofocus switch ring. Luck of lens-tripod mount rig. I did have them all, Canon, Nikon, and Zeiss ... But, The Sony FE 90mm f/2.8 G OSS Macro is an exception. At least in image quality department and that is always in my book priory. This lens feels good, the focusing is extremely accurate and overall, working with the lens is a pleasure. I am using this lens on A7R and A7RII and also on my A6000. The best result I am getting is in my studio on both A7r's with Elinchrom strobes. Processing images in CaptureOne v9.x is a delightful pleasure since seeing sharp, well-saturated results amazing me. The Sony FE 90mm f/2.8 G OSS Macro was awaiting addition in my Pelican case and no question about it also a well-worth investment.